Baltimore Design School: an Example of how CBP Gets Things Done! The Baltimore Design School, whose distinctive orange water tower is so evident in the City’s skyline, first came onto the CBP’s radar when it compiled a list of buildings that it felt should be subjected to code enforcement in Greenmount West, and some other Central Baltimore neighborhoods. The strategy (crafted by then CBP Executive Director, Joseph McNeely) was to single out buildings with an egregious lack of maintenance, rather than advocate for a blitz of the neighborhood with building inspectors.High on the list was the Lebow Building, a former garment factory, which at one time had been at the apex of modern industrial building design, but had now fallen on hard times. Shuttered since 1985, it was literally rotting when it appeared on CBP’s list in 2007. The City Government was responsive. Subsequent inspections led to fines that went unpaid, and City-ordered repairs that were never done. Finally a lien was placed against the building. This resulted in a standoff. The next step would have been to go to court to put the building into receivership. (A necessary step to enable the building to be auctioned off to the highest bidder.) But this is a step the City of Baltimore is reluctant to take without the likelihood of buyers. So CBP (working with its partner Jubilee Baltimore) sought potential buyers for the Lebow Building. Once the City was satisfied that developers were interested in turning the building into rental units, it went to court to put the building into receivership. But the process was slow, thanks to fierce opposition from the building’s owner, the Abraham Zion Corporation and their lawyers Shapiro, Sher, Guinot & Sandler, who challenged not only the City’s inspections, but the basic constitutionality of the receivership law. It seemed as if each legal round the City won only set the stage for future legal action. Things escalated. Neighborhood leaders went to court to show that the building was worse than simply in code violation; that it was an imminent threat to public safety. In collaboration with a clinic of the Law School of the University of Maryland, CBP worked with its partners in the community (such as the New Greenmount West Community Association) to help concerned residents (who were eyewitnesses to the danger) to file ‘amicus briefs’ documenting the “chunks of concrete” falling off the building, as described in the Daily Record. As a result, on September 15, 2009, A Baltimore Judge put an end to what had appeared to be an endless process, by ruling that the building was so dangerous it would have to be demolished immediately (rather be put in to receivership) with the costs to be paid by the Abraham Zion Corporation. Better than having a building rotting away, but not exactly a happy ending, either. Then CBP Partner Seawall Development, stepped in. Seawall was one of the real estate developers that had been interested in the project when CBP was trying to demonstrate the feasibility of receivership to the City. Unfortunately, early ideas about creating rental units through standard financing were no longer feasible. But (then CBP Steering Committee Chair) Fred Lazarus IV had an idea. He had been enlisted by (then) State Senator (now Baltimore mayor) Catherine Pugh to work on creating the Baltimore Design School. Why not turn the Lebow Building into the home of what would become the new Baltimore Design School? Seawall ran with the concept. It came up with $2 million to make a quick purchase of the building from the Abraham Zion Corporation before the teardown date. With no alternative – but to pay for demolition or sell, the New York-based company, which had so long resisted parting with its property, relented. With the change in ownership and what would turn out to be a $26.5 million innovative public/private financing scheme underway, the judge was satisfied that the building would no longer be a threat and the demolition order was removed. But the Central Baltimore Partnership’s work was not yet finished. In 2013, it applied for a grant to secure the funds to paint the water tower the distinctive orange that makes it so visible in the city’s skyline. The Baltimore Design School (with 100% graduation and college acceptance rates in 2017) is one of the jewels of the Baltimore Public School System. 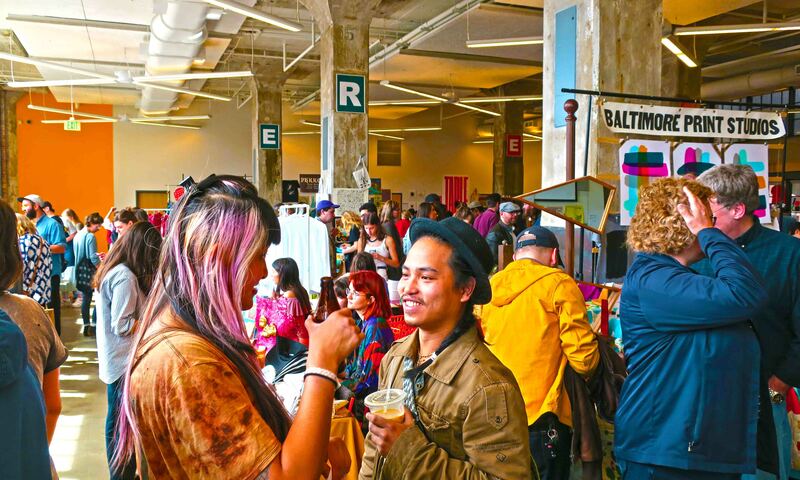 The building itself has become an asset to Central Baltimore through hosting public events such the PMF Fair pictured above.